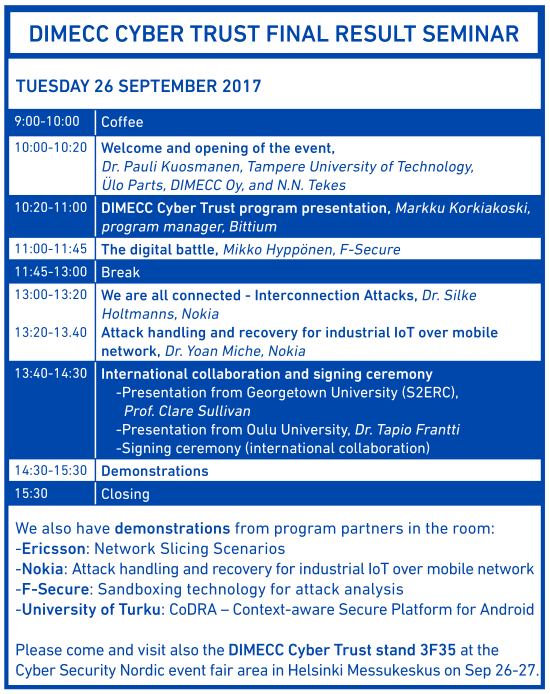 DIMECC Cyber Trust Final result seminar is arranged co-located with Cyber Security Nordic event on September 26 in Helsinki. Cyber Trust seminar will be arranged in Messukeskus Helsinki, Conference Centre, first floor, Conference room 102, Messuaukio 1, Helsinki. Registration is now open here! Detailed program can be seen below. Check also the Cyber Trust program’s own website and results here. Cyber Security Nordic is an event promoting the importance of cyber security for various business functions. The event consists of a high-profile conference and a trade fair presenting products and services on the branch. There is free access to the event and the exhibition both days and, free seminar on Wednesday, 27 September. Note! Please visit our booth (number 3F35) at the exhibition area. Conference program is chargeable (190€) on Tuesday, 26 September. Read more about the Cyber Security Nordic event here.